How to Use Stump Grindings as Mulch | Mr. Tree, Inc.
Are Your Trees Susceptible to Dutch Elm Disease? Trees are beautiful, beneficial for the environment and increase property value, but sometimes it is necessary to chop them down. Other times, they fall down on their own. In both instances, an unsightly stump remains. But, you’re not stuck with a stump in your yard. Instead, you can create mulch from stump grindings. If you chose to remove the stump yourself, you can easily rent a stump grinder in Portland for about $125 per day. However, if you are considering professional tree chopping assistance, ask about free stump grinding as this service is often complementary. Stump removal might seem like an easy process. However, it is expensive to rent the required equipment, may be a challenge to operate and leaves a mess of wood pieces to clean up. When you work with a professional tree service, the process will be fast, your land will be flush (companies grind 10-12 inches below the soil grade) and will be free from debris. And, when a professional grinds your stump down, you can request to keep the grindings to use as mulch. Keep in mind that while stump grinding inhibits most plant growth, some trees are excellent at regenerating. Specifically, willow, poplar and some varieties of flowering cherry trees have known to regrow up to five years later. It is recommended to use herbicide in the area of stump removal to ensure regeneration does not occur. 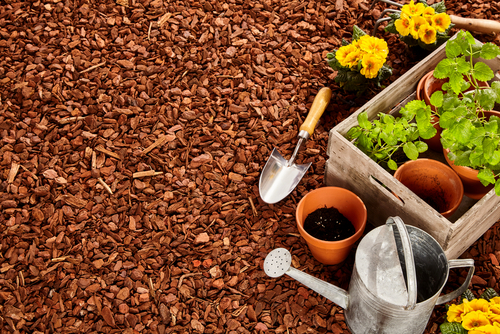 Usually, people just toss their stump grindings, but rather than just discarding the wood chippings in the dumpster or compost pile, you can create mulch. This alternative will benefit your garden and your wallet. Like shredded bark, the chippings will insulate your soil keeping it warmer in the winter and cooler in the summer, reduce evaporation, retain moisture and reduce germination of some weed seeds and make weed removal easier. Rake up the wood chippings into a pile. Ideally your leaf rake has flexible, close-spaced teeth to easily gather large and small pieces. Scoop the material into a garden cart or wheelbarrow with a flat shovel. If you grind the stump yourself, rake up the grindings before grinding below soil grade to avoid mixing soil with the wood material. Pick out any grass that may have entered the mix. Leaves and evergreen needles are acceptable. If the soil in your garden is not fertile, spread a one-inch thick layer of nutrient-rich compost around your plants. While wood chips will provide some nutrients, compost contains decomposed plants, which is best in most situations. Evenly spread a three to six-inch layer of wood chippings around the base of your plants, using three inches around smaller plants like annuals and up to six inches for larger plants like trees. Do not place the mulch directly against the plants as this can lead to decay or infestation of the live plant. Leave at least six inches between the mulch and the base of a tree. Mix the chippings with mulch or shredded bark if you do not have enough chippings. Replenish mulch as the stump grindings decompose. If you are concerned that the chopped or fallen tree was diseased before the stump grinding process, this is not a concern when the mulch is applied above the soil surface. However, if you are still anxious about the health of your plants, just discard the wood chippings. Termites are also a concern for many when creating mulch from old stumps. It is a myth to say that termites are attracted to wood chips. However, it is not uncommon to find termites in a stump, as their job is to decompose wood. For this reason, it is commonly recommended that any mulch created by wood chippings from stump grindings be used at least two feet away from your home’s foundation. If you have excess wood chippings or find that your plants do not positively benefit from your mulch, here are other ways to use your wood chippings after stump grinding. Install a Path – If you already have established paths of bark or tree mulch in your yard, just spread four inches of wood chippings over your existing paths. Make a new path by using a lawn mower to cut grass and weeds as close to the soil as possible. Then spread four to six inches of wood chippings in the desired area. Compost the Material – If the tree that fell or was chopped down was diseased before stump grinding, the wood chippings can still be composted and used as topical mulch. However, it is best to let it sit for up to a year before use. Keep the pile evenly moist and rotate weekly for appropriate aeration. Burn the Debris – If the tree stump was chemically treated to encourage quicker decomposition, it is best to burn the grindings. If you plan a burn, first check with your local fire department and permitting office to ensure safety and proper permission.